On the 29th of May, Bonhams Australia will auction a fantastic catalogue of art from the Fehily Collection of Contemporary Art including a number of significant contemporary Aboriginal works by the likes of Julie Dowling, Gordon Bennett and Brook Andrew. The works being offered are part of a large collection established by Lisa and Ken Fehily who are the co-directors of a Melbourne based exhibition space dedicated to cutting-edge Australian and international art. Ken and Lisa are selling part of their private collection to allow a move to a smaller residence in the city where they will work on a range of new projects including a charity which will be established using some of the proceeds of the sale. Gordon Bennett’s confronting Haptic Painting (Explorer: The Inland Sea) is one of the highlights of the sale and is being offered as lot 17 with an estimate of $90,000-$120,000. 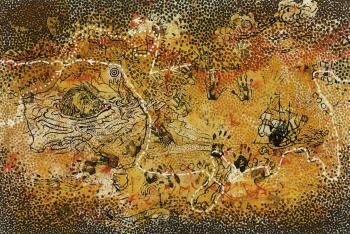 The huge 2.6 by 1.8 metre canvas, last sold at auction in 2002 by Sotheby’s for $47,500, combines maps of journeys by Captain James Cook and William Dampier to the 'New World' in the southern hemisphere with powerful imagery alluding to the effects that European occupation had on the Aboriginal people. 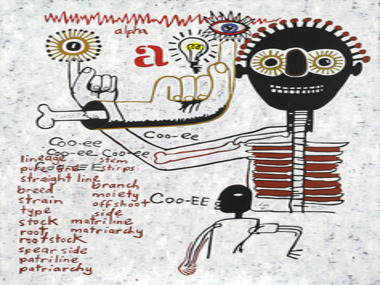 Other Aboriginal works include Lot 12, another painting by Gordon Bennett titled Coo-ee estimated to fetch $30,000-$40,000; Lot 38, a screen print by Brooke Andrew titled Gun-Metal Grey Dhaagun (Earth) is estimated to fetch $18,000-$24,000 and two works by Julie Dowling selling as lots 7 and 34 are estimated to bring $9,000-$14,000 and $18,000-$22,000 respectively.